-- Steve holds a stack of papers in his hand (eBay pages) and of course has his cell phone in his pocket. 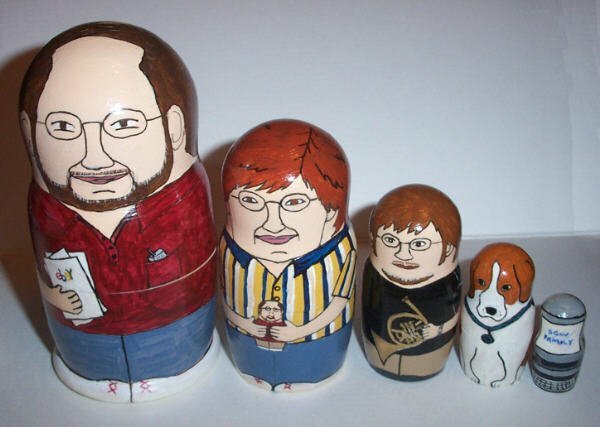 -- Barb holds the “Steve” nesting doll in her hands. Her white tennis shoes with red laces match Steve’s. -- Alex (in traditional black t-shirt and tan cargo pants) holds his French horn. -- Oreo, the beagle has all the right markings, down to the white tip of his tail, and his white bikini line. Gayle did a great job painting these dolls and painted them with acrylic paint on blank dolls, and her husband painted Alex’s horn and added five coats of shellac. Gayle also sewed them a nice bag with green ribbon, and Barb was really surprised when she opened it. She laughed and laughed.